Advocates of federal and state minimum wage increases often cite poor single mothers as a target population for minimum wage protection. However, the empirical evidence shows that most minimum wage workers are neither single mothers nor poor. In fact, poor single mothers comprise less than 5 percent of all minimum wage workers, and almost 55 percent already earn wage rates greater than $7.25 per hour, the new higher federal minimum wage rate. 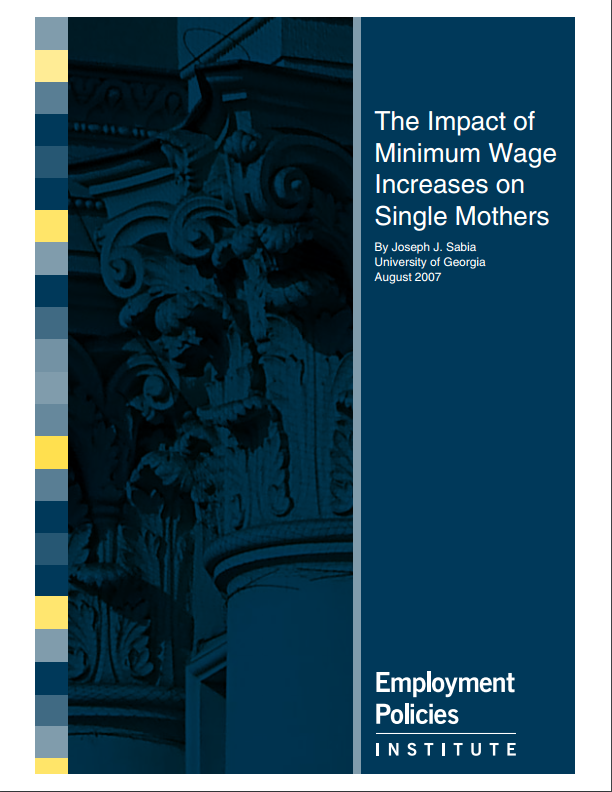 Thus, most single mothers are unlikely to be affected by minimum wage policies. However, the minimum wage may have important effects on a subset of single mothers: those that are lower-skilled and less-educated. While minimum wage increases do raise the wage rates of employed less-educated single mothers, the evidence consistently shows that there are adverse employment and hours effects that undermine these wage gains. For single mothers without a high school diploma, a 10 percent increase in the minimum wage is associated with a 6.0 percent reduction in employment, an 8.5 percent reduction in steady work (1,040 annual hours), and a 14.5 percent reduction in full-time work (1,820 annual hours). The author also finds that minimum wage hikes have no significant impact (either positive or negative) on the poverty rates of single mothers of any education level. Additionally, higher minimum wages appear to actually increase the amount of welfare use by single mothers. For less-educated single mothers, a 10 percent increase in the minimum wage is associated with an approximately 8 percent increase in welfare receipt. While this effect is imprecisely estimated and bears further examination, it is consistent with earlier research. In contrast, a far more effective pro-work strategy would be to expand the federal Earned Income Tax Credit (EITC) and/or its state supplements. The author finds that a 10 percent increase in the state EITC refundable credit is associated with a 1.0 to 1.5 percent increase in employment for single mothers, while simultaneously increasing hours and weeks worked as well. Most working poor households—especially single mother and African American households—would benefit from the EITC, while only a small minority would gain from a minimum wage hike. And because EITC costs are not borne by employers, there will be no reduction in demand for low-skilled workers, as is the case with a minimum wage increase. Taken together, the 1990s and early 2000s saw important economic changes for single mothers. Employment rates, work hours, and wage income rose, while poverty rates and welfare use declined. The evidence presented in this study suggests that while pro-work welfare reforms, a growing macro-economy, and expansions in the Earned Income Tax Credit program may have each played a role in these positive economic trends, increases in the minimum wage did not. Rather, this study finds that minimum wage increases reduced less-educated single mothers’ employment, hours worked, and wage income, while failing to alleviate poverty. The results of this study should serve as a caution to policymakers who view minimum wage hikes as a way to help single mothers.